Naturally, you start to panic. It’s hard enough to find ONE idea he likes well enough for Halloween, now you’re supposed to come up with TWO? Hold up. Take a moment, do your breathing exercises. We’ve got this. Don’t worry. Behold! The Boy’s Skeleton Ninja Muscle Costume...Ta-dah! It’s two of his favorite things--a skeleton and a ninja--miraculously combined! 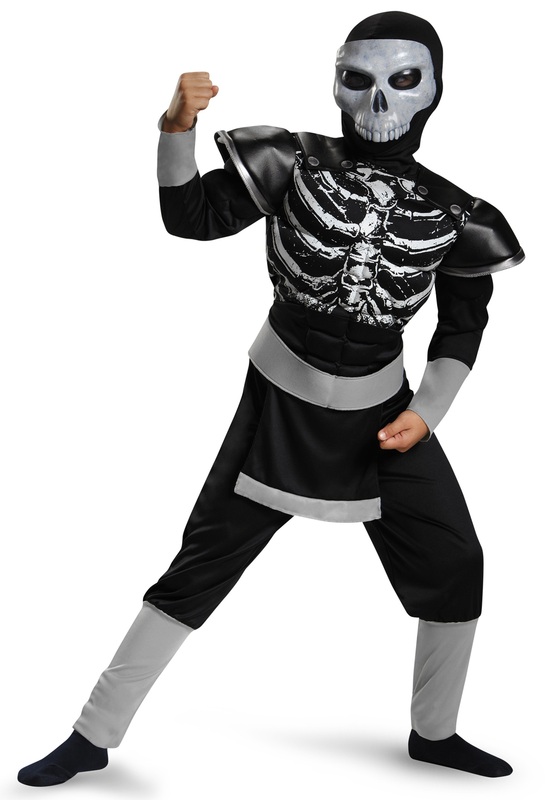 No, we hadn’t heard that all the kids wanted hybrid costumes, we just thought it would be cool to see a ninja that was also a skeleton. We mean, who says you can’t be skin-and-bones and totally buff? Turns out, this costume is totally awesome, so, you're welcome! Not only is this jumpsuit printed with skeleton bones on the front, but it’s padded to make your little trendsetter feel like a dedicated ninja trainee. Too bad the hood and mask make him unrecognizable; he could gain valuable hall cred for this innovative look. We’re guessing he’ll reveal himself during lunch, at least. And you, dear, can rest easy now knowing Halloween is taken care of and his world won’t fully collapse under the weight of his costume choice...this time!